A new vintage shop has opened in Cardiff City Centre. 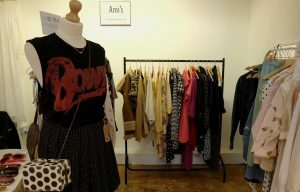 Ami’s sells women’s vintage clothes, jewellery and accessories, along with a few more modern ‘preloved’ items. The small shop is based in the Castle Emporium on Womanby Street, opposite Clwb Ifor Bach and is run by Ami Christopher. Ami says “It started with my own thrifting obsession – not wanting to wear the same as everyone else, whilst maintaining a modern sense of style. I wanted to create a space where women can find individual, beautiful pieces without having to spend too much. Also people are becoming more aware of the problems caused by fast fashion regarding both the environment and employee conditions so sustainable, conscious fashion is more in demand. The combination of affordable and ethical makes it guilt free plus wearing something unique is an added benefit. Prices range between £4 for a scarf and £50 for a vintage lace wedding dress, with most items priced around £15. The shop shares a space at the Castle Emporium with other independent businesses including a coffee shop, art shop and tailor and is open Tuesday – Saturday.